Young Sora in Kingdom Hearts. Sora in Atlantica in Kingdom Hearts. Sora in Halloween Town in Kingdom Hearts. Sora's sprite when he takes damage. Sora's sprite when he is in critical condition. Sora's normal sprite when visiting Atlantica. Sora's Atlantica sprite when he takes damage. Sora's Atlantica sprite when he is in critical condition. Sora's normal sprite when visiting Halloween Town. Sora's Halloween Town sprite when he takes damage. Sora's Halloween Town sprite when he is in critical condition. Sora's HUD in Kingdom Hearts. Sora, Riku, and Kairi rest from working on their raft. Sora speaks to a mysterious hooded figure in the secret place. Sora receives the Kingdom Key. Sora wakes up in Traverse Town beside Pluto. Sora accepts Donald and Goofy's invitation to travel the World in search of their friends. Sora startled when Riku transforms a Heartless to look like him, and sends it after him. In order to free Kairi's heart from within himself, Sora releases his heart with the Keyblade of heart, becoming a Heartless in the process. Sora as a Heartless in Hollow Bastion. Sora promises Kairi he will come back to her, before she is pulled away to the restored Destiny Islands. Sora as Kairi sees him in the Secret Place. Sora, Donald, and Goofy walk through the plains as they formulate a plan to find Riku and Mickey. Sora's talk sprite in Kingdom Hearts Chain of Memories. Sora's sprite in Kingdom Hearts Chain of Memories. Sora in Kingdom Hearts II. Another Sora in Kingdom Hearts II. Sora's normal sprite in his Kingdom Hearts clothes. Sora's sprite in his Kingdom Hearts clothes when he takes damage. Sora's sprite in his Kingdom Hearts clothes when he is in critical condition. Sora's normal Valor Form sprite. Sora's sprite when he takes damage during Valor Form. Sora's sprite when he is in critical condition during Valor Form. Sora's normal Wisdom Form sprite. Sora's sprite when he takes damage during Wisdom Form. Sora's sprite when he is in critical condition during Wisdom Form. Sora's normal Limit Form sprite. Sora's sprite when he takes damage during Limit Form. Sora's sprite when he is in critical condition during Limit Form. Sora's normal Master Form sprite. Sora's sprite when he takes damage during Master Form. Sora's sprite when he is in critical condition during Master Form. Sora's normal Final Form sprite. Sora's sprite when he takes damage during Final Form. Sora's sprite when he is in critical condition during Final Form. Sora's normal sprite when visiting Timeless River. Sora's Timeless River sprite when he takes damage. Sora's Timeless River sprite when he is in critical condition. Sora's normal Valor Form sprite when visiting Timeless River. Sora's Timeless River sprite when he takes damage during Valor Form. Sora's Timeless River sprite when he is in critical condition during Valor Form. Sora's normal Wisdom Form sprite when visiting Timeless River. Sora's Timeless River sprite when he takes damage during Wisdom Form. Sora's Timeless River sprite when he is in critical condition during Wisdom Form. Sora's normal Limit Form sprite when visiting Timeless River. Sora's Timeless River sprite when he takes damage during Limit Form. Sora's Timeless River sprite when he is in critical condition during Limit Form. Sora's normal Master Form sprite when visiting Timeless River. Sora's Timeless River sprite when he takes damage during Master Form. Sora's Timeless River sprite when he is in critical condition during Master Form. Sora's normal Final Form sprite when visiting Timeless River. Sora's Timeless River sprite when he takes damage during Final Form. Sora's Timeless River sprite when he is in critical condition during Final Form. Sora's normal Antiform sprite when visiting Timeless River. Sora's normal Valor Form sprite when visiting Halloween Town. Sora's Halloween Town sprite when he takes damage during Valor Form. Sora's Halloween Town sprite when he is in critical condition during Valor Form. Sora's normal Wisdom Form sprite when visiting Halloween Town. Sora's Halloween Town sprite when he takes damage during Wisdom Form. Sora's Halloween Town sprite when he is in critical condition during Wisdom Form. Sora's normal Limit Form sprite when visiting Halloween Town. Sora's Halloween Town sprite when he takes damage during Limit Form. Sora's Halloween Town sprite when he is in critical condition during Limit Form. Sora's normal Master Form sprite when visiting Halloween Town. Sora's Halloween Town sprite when he takes damage during Master Form. Sora's Halloween Town sprite when he is in critical condition during Master Form. Sora's normal Final Form sprite when visiting Halloween Town. Sora's Halloween Town sprite when he takes damage during Final Form. Sora's Halloween Town sprite when he is in critical condition during Final Form. Sora's normal Antiform sprite when visiting Halloween Town. Sora's normal sprite when visiting Christmas Town. Sora's Christmas Town sprite when he takes damage. Sora's Christmas Town sprite when he is in critical condition. Sora's normal Valor Form sprite when visiting Christmas Town. Sora's Christmas Town sprite when he takes damage during Valor Form. Sora's Christmas Town sprite when he is in critical condition during Valor Form. Sora's normal Wisdom Form sprite when visiting Christmas Town. Sora's Christmas Town sprite when he takes damage during Wisdom Form. Sora's Christmas Town sprite when he is in critical condition during Wisdom Form. Sora's normal Limit Form sprite when visiting Christmas Town. Sora's Christmas Town sprite when he takes damage during Limit Form. Sora's Christmas Town sprite when he is in critical condition during Limit Form. Sora's normal Master Form sprite when visiting Christmas Town. Sora's Christmas Town sprite when he takes damage during Master Form. Sora's Christmas Town sprite when he is in critical condition during Master Form. Sora's normal Final Form sprite when visiting Christmas Town. Sora's Christmas Town sprite when he takes damage during Final Form. Sora's Christmas Town sprite when he is in critical condition during Final Form. Sora's normal Antiform sprite when visiting Christmas Town. Sora's normal sprite when visiting Pride Lands. Sora's Pride Lands sprite when he takes damage. Sora's Pride Lands sprite when he is in critical condition. Sora's normal sprite when visiting Space Paranoids. Sora's Space Paranoids sprite when he takes damage. Sora's Space Paranoids sprite when he is in critical condition. Sora's normal Valor Form sprite when visiting Space Paranoids. Sora's Space Paranoids sprite when he takes damage during Valor Form. 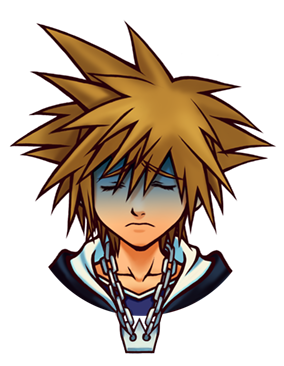 Sora's Space Paranoids sprite when he is in critical condition during Valor Form. Sora's normal Wisdom Form sprite when visiting Space Paranoids. Sora's Space Paranoids sprite when he takes damage during Wisdom Form. Sora's Space Paranoids sprite when he is in critical condition during Wisdom Form. Sora's normal Limit Form sprite when visiting Space Paranoids. Sora's Space Paranoids sprite when he takes damage during Limit Form. Sora's Space Paranoids sprite when he is in critical condition during Limit Form. Sora's normal Master Form sprite when visiting Space Paranoids. Sora's Space Paranoids sprite when he takes damage during Master Form. Sora's Space Paranoids sprite when he is in critical condition during Master Form. Sora's normal Final Form sprite when visiting Space Paranoids. Sora's Space Paranoids sprite when he takes damage during Final Form. Sora's Space Paranoids sprite when he is in critical condition during Final Form. Sora's normal Antiform sprite when visiting Space Paranoids. A flashback of Sora at Hollow Bastion in the intro. Sora is released from his Memory Pod in front of Roxas. Sora meets Yen Sid, who describes the situation of the worlds, including the still-present Heartless, as well as the Nobodies and Organization XIII. Sora, Donald, and Goofy salute Queen Minnie. Sora at the Garden of Assemblage in the Cavern of Remembrance in Kingdom Hearts II Final Mix. Sora reunites with Kairi in The World That Never Was. Sora and Riku in the Realm of Darkness. Artwork of Sora as it appears in Mission Mode. Sora's artwork on his status screen. Xion, having absorbed many of Sora's lost memories, takes his form during a nightmare. Sora in Kingdom Hearts Birth by Sleep. Sora and Riku are visited by a mysterious girl, who tells Sora to always be there for Riku. Sora and Riku meets Aqua on Destiny Islands. After reading the King's letter, Sora prepares for his new journey, to save those connected to him. Sora's new outfit in Kingdom Hearts 3D: Dream Drop Distance. Sora in Dream Drop Distance, wielding the Kingdom Key. Sora as he appears in The Grid. Sora and Riku listening to Yen Sid before their exam. Sora and Riku begin their Mark of Mastery exam on Destiny Islands. Sora and Riku on a raft. Sora meets Xion in the depths of his dreams. Sora listening to Roxas share his grief. Bolstered by the support of his friends and allies, Sora stands up to Xigbar and Xemnas in the depths of his dreams. Sora partying with Donald and Goofy after the exam. Sora's updated model from Kingdom Hearts HD 1.5 ReMIX. Sora's model from Kingdom Hearts HD 2.5 ReMIX. Sora's model from Kingdom Hearts Dream Drop Distance HD. Sora in his Kingdom Hearts III outfit. Another render of Sora's Kingdom Hearts III outfit. A render of Sora with the Starlight Keyblade. A close-up render of Sora with Starlight. A collection of Sora's memories in the Dive to the Heart. Sora, Donald, and Goofy prepare to fight an army of Heartless, Nobodies, and Unversed. Sora in his Kingdom Hearts outfit. Sora in his Christmas Town Form. Sora in his Halloween Town Form. Sora as he appears in the Kingdom Hearts Chain of Memories manga. Early concept design of Sora as a half-lion chainsaw wielder. Sora's second early concept design. Sora's third early concept design. Concept artwork of Sora's face. Concept artwork of Sora's expressions. Concept artwork of Sora's "hurt" sprite. Concept artwork of Sora's "critical" sprite. Riku, Kairi and Sora in an concept artwork. Artwork of Sora in Kingdom Hearts. Another artwork of Sora in Kingdom Hearts. Artwork of a young Sora in Kingdom Hearts. Sora in the "Beach" promotional artwork for Kingdom Hearts. Artwork of Sora in the "Wind" promotional artwork for Kingdom Hearts Final Mix. Full-body portrait of Sora's Atlantica Form in Kingdom Hearts. Headshot of Sora's Atlantica Form in Kingdom Hearts. Full-body portrait of Sora's Halloween Town Form in Kingdom Hearts. Headshot of Sora's Halloween Town Form in Kingdom Hearts. Sora with the main cast in a promotional artwork for Kingdom Hearts. Sora with the main cast in another promotional artwork for Kingdom Hearts. Sora with Donald and Goofy in the "Piggyback" promotional artwork. Sora with Donald and Goofy in the "Throne" promotional artwork. Sora with his friends in the "Friends" promotional artwork. Sora with the main cast in the "Foreboding" promotional artwork. Sora in the "Connections" promotional artwork. Sora with the main cast in the "Rest (Day)" promotional artwork. Sora with the main cast in the "Rest (Night)" promotional artwork. Sora on the cover of the Kingdom Hearts Final Mix Ultimania. Sora in the "Deck" promotional artwork for Kingdom Hearts Re:Chain of Memories. Sora in a variant artwork for the "Deck" Kingdom Hearts Re:Chain of Memories. Sora with Donald, Goofy, and Naminé in the "Spiral" artwork. Sora in the Spiral artwork. Calendar artwork of Sora for December. Artwork of Sora from Kingdom Hearts Re:Chain of Memories. Artwork of Sora on a seashore in the "Sea" promotional artwork. Artwork of Sora eating ice cream with Roxas in the "Late Summer" promotional artwork. 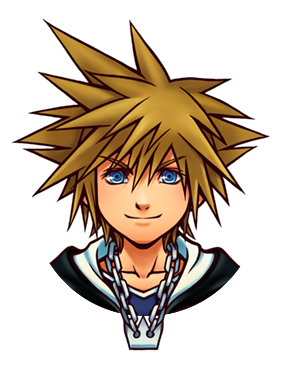 Artwork of Sora as he appears in Kingdom Hearts II. Artwork of Sora as he appears in Space Paranoids. Artwork of Sora as he appears in Timeless River. Artwork of Sora as he appears in the Pride Lands. Artwork of Sora's Wisdom Form. Artwork of Sora's Master Form. Sora in the "Heart" promotional artwork. Sora in the "Invitation" promotional artwork. Sora in the "Awakening" promotional artwork. Sora in the "Duality" promotional artwork. Sora in the "EDGE" promotional artwork. Sora with Roxas, Mickey, Goofy, and Donald in a CG promotional artwork. Sora in a promotional artwork for Kingdom Hearts II Final Mix. Sora, Donald, Mickey, and Goofy on album cover of Kingdom Hearts Original Soundtrack Complete. Sora and company in the "Smile" promotional artwork. Sora in a promotional artwork for Kingdom Hearts coded. 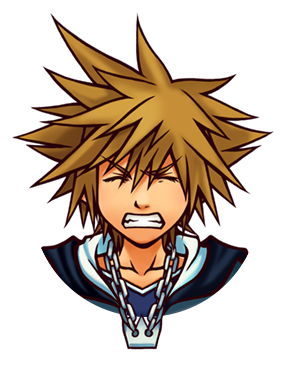 Artwork of Sora as he appears in The Grid. Sketch of Sora and Riku by Tetsuya Nomura for Japan Expo 2012. Sora, Riku, and Mickey in the "Sea of Clouds" promotional artwork. Sora, Riku, and Mickey in the "Twilight" promotional artwork. Sora, Riku, and Dream Eaters in the "Entryway to the Dream" promotional artwork. Sora falling from the sky with Riku and Mickey nearby in the "Distance" promotional artwork. Sora and Riku crossing their Keyblades in a promotional artwork for Kingdom Hearts 3D: Dream Drop Distance. Sora and Riku in a promotional artwork for Kingdom Hearts 3D: Dream Drop Distance. Sora in a promotional artwork for Kingdom Hearts HD 1.5 ReMIX. Sora in a CG promotional artwork for Kingdom Hearts HD 1.5 ReMIX. Sora in a promotional artwork for Kingdom Hearts HD 2.5 ReMIX. Sora in a promotional artwork for Kingdom Hearts HD 2.8 Final Chapter Prologue. Sora eating a paopu fruit. Sora sitting on a throne. Sora with Riku and Kairi on the Proud result screen. Sketch of Sora by Tetsuya Nomura for D23 Expo Japan 2013. Artwork of Sora as he appears in World of Final Fantasy. Sora in a promotional artwork for Kingdom Hearts 358/2 Days, Kingdom Hearts coded, and Kingdom Hearts Birth by Sleep.